Republican presidential contender Donald Trump has been looking for ways to reach out to evangelical voters before the GOP primaries. On Sunday, the businessman and his wife attended church services at the nondenominational First Christian Church, in Council Bluffs, Iowa. But when the Communion plates were passed, Trump mistook the silver plates for the offertory, digging out several bills from his pocket, according to the Associated Press. He, his wife and two staffers took Communion, the AP reports. “I thought it was for offering,” he told staffers with a laugh. He contributed money several minutes later when the offering plates were passed. Efforts to reach the Trump campaign and the church were unsuccessful on Monday. Since Clinton is in little danger of losing her party’s secular left wing, she has a very real—and rare—opportunity to woo religious voters. Her impromptu campaign forays into her faith could be expanded into a robust public case for the principles of liberal Christianity. She is uniquely positioned to contend that affordable health care, a higher minimum wage, and paid family leave are moral arguments at heart (borrowing from her Democratic primary rival), and to speak about them in the language of what is still the mainstream religion of the U.S.—transforming the idea of who qualifies as a “values voter” in America. In the America of 2016, that's a heavy lift- a very heavy lift. 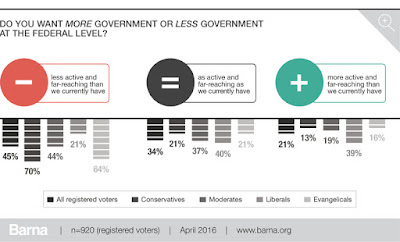 Most self-described evangelicals are suspicious of Democrats as well as liberals, and being a woman doesn't make it any easier. For the majority, neither "affordable health care" nor "a higher minimum wage" nor "paid family leave" is the major issue. (If it were, perhaps Republican Trump could concede now and we could go right to the parties on Inauguration Day.) They may not vote for Cllinton- for whom there is considerable distaste- but these voters might not come out in numbers Trump would need to win in Virginia and Florida, or even in North Carolina and Georgia. has the Clinton-Trump God gap at under 15 points, with those who say they go to church at least once a week preferring Trump to Clinton by nine points and those attending less frequently preferring Clinton to Trump by less than six. 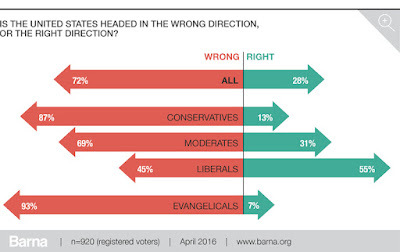 That compares to a God gap in 2012 of nearly 40 points. At this point- before either candidate even has been nominated- the (nearly) presumptive Democratic nominee is +40 compared to 2012. Although it's not clarified, the criteria of church attendance suggests the survey was not restricted to whites, startling given Barack Obama's unprecedented appeal to blacks, whose church attendance typically exceeds that of whites. 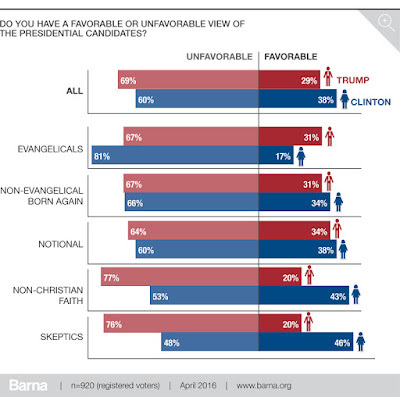 A more complex survey, one conducted by the Barna Group, compared the unfavorable and favorable ratings (graph below) of the two likely nominees in several defined religious categories: evangelical, non-evangelical born again, notional, non-Christian faith, and skeptics. The most glaring indication is that both candidates are unpopular among the religious. The largest advantage for Trump is in the first group but is hardly crushing and at 14 points does not bode well for him. It is Way Too Early. Choice of running mates, the conventions, debates, other campaign activities, and especially national and international events will intervene. 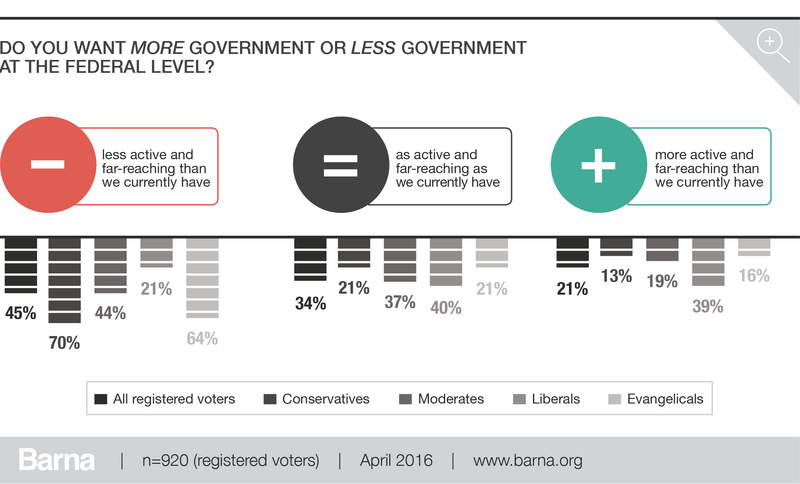 Most fundamentals, including right-track-wrong track numbers and sentiment about the size of government (charts below) favor the GOP candidate, any GOP candidate, among theologically conservative Christians and will be extremely difficulat to overcome. Nonetheless, Hillary Clinton probably would be the least secular Democratic presidential nominee since James Earl Carter and would face the Trump of the Little Cracker. What Ruth Graham maintains of Democrats generally since social gospel evangelicals tried to start a movement in 1973 will be particularly true of this presidential race: "it would be unfair to say that liberal Christians haven't tried to make noise. But now, 43 years later, they may have their best chance to be heard."